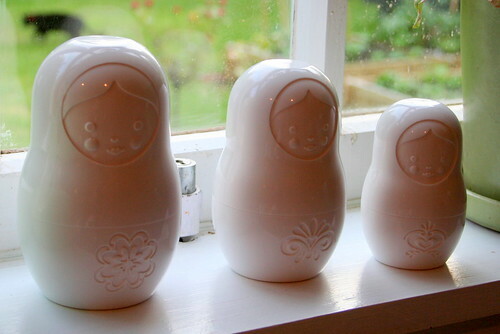 I picked up those Matryoshka measuring cups this week at Wanda Harland in Petone. I went into the shop looking for a birthday present for a friend and ended up buying a present for myself as well. Each half doll is a different sized measuring cup. As well as the standard 1 cup, 1/2 cup, 1/3 cup and 1/4 cup, the set includes 2/3 and 3/4 sized measures which is pretty handy. They can be nested to save space, but I like the look of the three of them sitting on my kitchen windowsill. And in case you're wondering, that's Molly the cat making an unplanned cameo in the background. Dang - too late to get out there today! LOVE THESE! These are so cute!!! I want some. Gorgeous - I want some too! And go Molly, tell her I think she looks sleek! Whoah - those are aMAZing!! What a super genius idea. oo. I have these too. I literally squeeled when I saw them, and I had to have them. They are so adorable!